The Woolly-necked Stork, Ciconia episcopus is a large wading bird in the stork family Ciconiidae. It is a widespread tropical species which breeds in Africa, and also in Asia from India to Indonesia. It is a resident breeder in wetlands with trees. The large stick nest is built in a forest tree, and 2-5 eggs form the typical clutch. 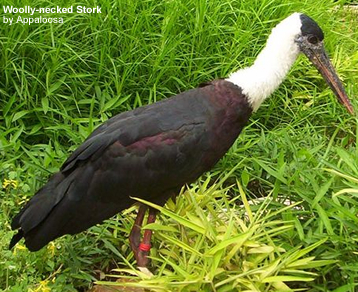 This stork is usually silent, but indulges in mutual bill-clattering when adults meet at the nest. The Woolly-necked Stork is a large bird, typically 85cm tall. It is all black except for the woolly white neck and white lower belly. The upperparts are glossed dark green, and the breast and belly have a purple hue. Juvenile birds are duller versions of the adult. The Woolly-necked Stork walks slowly and steadily on the ground seeking its prey, which like that of most of its relatives, consists of frogs, lizards and large insects. African birds are attracted to bush fires.